Ajunta. General view of the caves. Comprising Caves No 21 and 26.
bl.uk > Online Gallery Home	> Online exhibitions	> Asia, Pacific and Africa Collections	> Ajunta. General view of the caves. 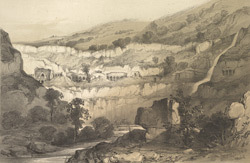 Comprising Caves No 21 and 26. This is plate 4 from James Fergusson's 'Illustrations of the Rock Cut Temples of India'. In 1819 a group of tiger-hunting British soldiers discovered the Ajanta caves in the jungles of a ravine. The 30 magnificent cave temples are situated in a horse-shoe valley of the Waghora river in West India and consist of prayer halls (chaityas), or monasteries (viharas), built for the Buddhist community who lived there. The caves were in use for about 8 centuries, and can be divided into two groups according to the early Hinayana and later Mahayana phases of Buddhist art. The first group was excavated between the second and first centuries BC, while the second is dated to around the fifth century AD. The viharas are arranged in clusters near chaityas. Caves 21 to 26 were excavated late. Cave 21 is a vihara and Cave 26 is a chaitya. The latter is elaborately decorated with fine, eloquent sculpture.